Welcome to Lesson 2 of our DIY Summer School Series, hosted by Beth of designPost Interiors! This week's theme is "thrifted" and as a frequent visitor to the Good Will nearby, this was right up my alley. I'm going to share with you the simple way you can make a pendant light fixture out of a thrift store shade. Back when I did our nursery, I was obsessed with some of the woven pendants that Serena & Lily were selling. But their $300 price tag was out of the question. I happened upon a drum shade at our local thrift shop (and unlike some magical thrift store finds that no one is ever going to score again, a pile of discarded shades is a constant at thrift stores), and it gave me a great DIY idea. I dug through my photos and I can't believe I have NO progress pictures of this project. It leads me to believe my iPhone had been having one of its characteristic melt-downs that week, because I've never not taken progress photos. The good news is, it's basically self-explanatory, and I think you'll understand how to do this even without pictures. Head over to your local thrift store to search for a shade. Any size that suits you is fine. Mine was about 18” high and a perfect cylinder. A drum shade (cylindrical shape) or something close looks best for this project. It’s easiest if the color of the shade is tan or cream (similar to the color of the raffia) because it will show through. If it is a drastically different color or wouldn’t coordinate well, I suggest painting it first. My shade was $1 at Good Will. Glue gun and glue sticks- way more than you think, stock up! This is actually quite easy to do- it just takes a long time. You are going to wrap the raffia around the drum shade, securing it with hot glue every few inches as you go along. That’s all there is to it- start at the bottom and work your way to the top, going around and around and around and around. My shade is very large and took me about 6 hours to complete. 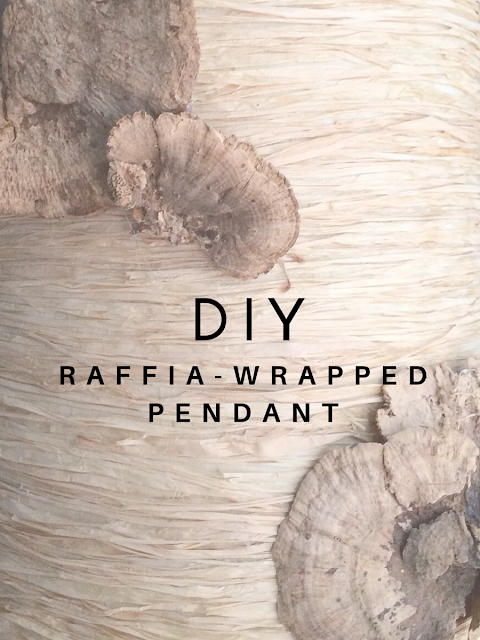 Once your raffia is secured and dry, add your mushrooms. I arranged them in two places and played with the spacing and orientation until it looked right. Keep in mind the side you’ll want to keep facing front, and how it will look when it’s hung at eye level. After everything is dry, you will install this downlight kit in your ceiling. Slide the shade over the rod and then place the bulb underneath. It is critical that you use a pendant kit with a solid metal rod (not a chain or fabric cord). If you don’t have a solid metal rod, the off-balance weight of the mushrooms will cause the shade to hang crookedly. A solid metal rod will hold it straight. And that’s it! Very time consuming but very easy. I absolutely love the organic look of this shade and the statement piece that it is in the room. It can go with a range of different styles and adds a unique touch to the room. 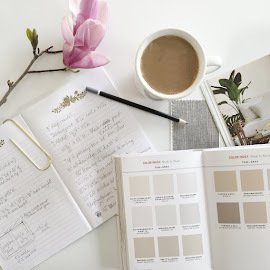 (Of course I'm very style conflicted right now, as I've been working on setting up these Pinterest boards for clients to help them narrow down their "Style Profile"...and realizing my style is ALL of them! Yikes!) Anyway, I'm glad the pendant has been able to pull off a Preppy nursery and can now morph to Rustic, Cabin and Camp pretty seamlessly as that nursery becomes a guest room. Not bad for under $40. Be sure to visit the other teachers of DIY Summer School below. I'm excited to see the projects they've come up with after their thrift shopping sprees! Bloggers, do you have a thrift store DIY to share? 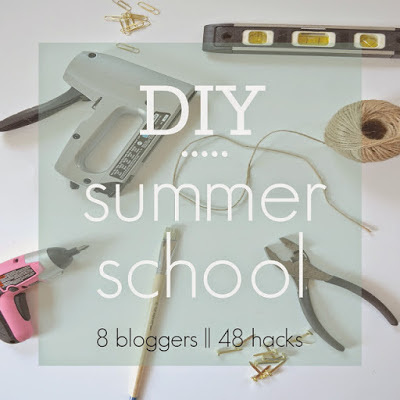 We would love for you to link it up below and/or tag a photo on Instagram with #DIYSummerSchool (you don't even have to be a blogger to do that part)! 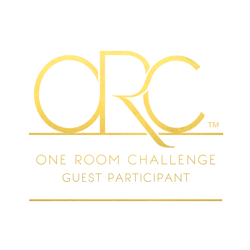 See you for the next class...July 9th for a "wildcard" project. Laura this looks like it could be hanging in Anthropologie! So earthy and pretty! Thank you Beth- that's like the best compliment ever!!! 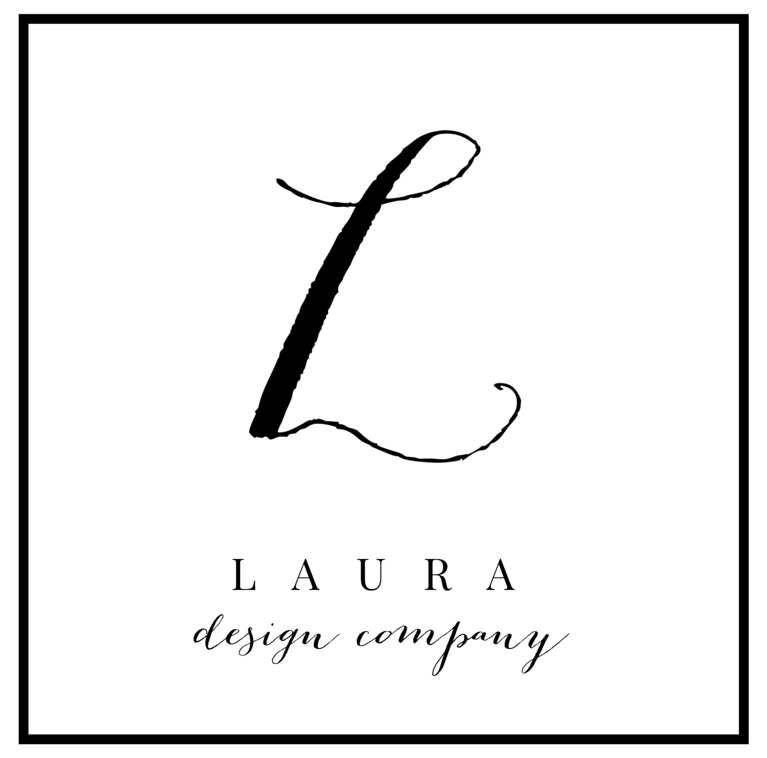 HA i love step #3 ;) This is gorgeous, Laura! So creative, love it! What a great idea! I think step #3 is definitely the key for this one. Pretty!